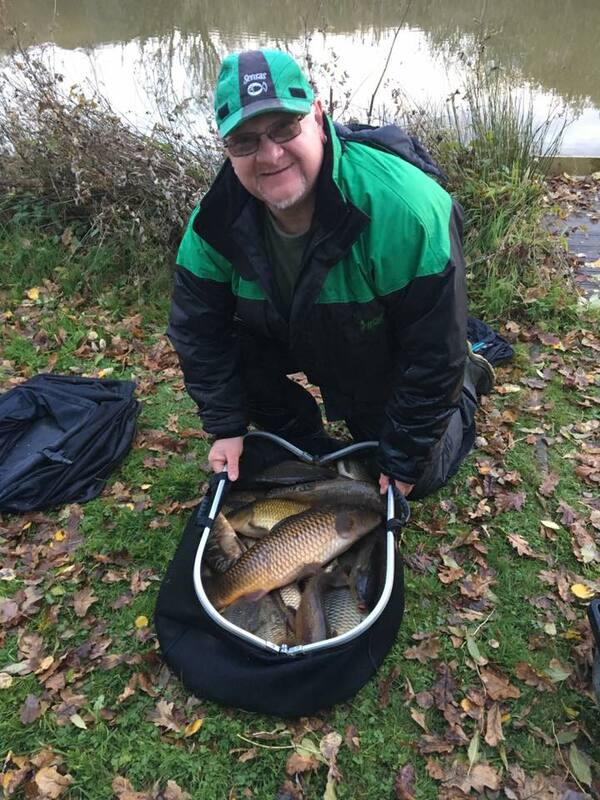 A big thank you to the 21 anglers who turned out to fish Wooda Lakes Annual Fur ‘n Feather Match, fished across their Mixed Match and Carp match lakes. 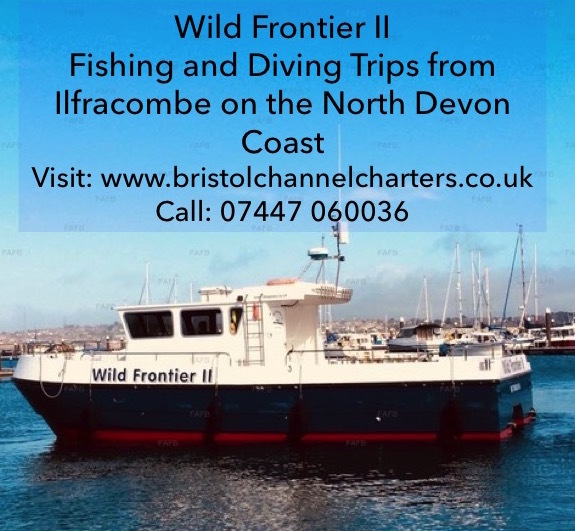 With mild weather the fishing ought to have been excellent, but with an influx of cold water it made for tough fishing for most. 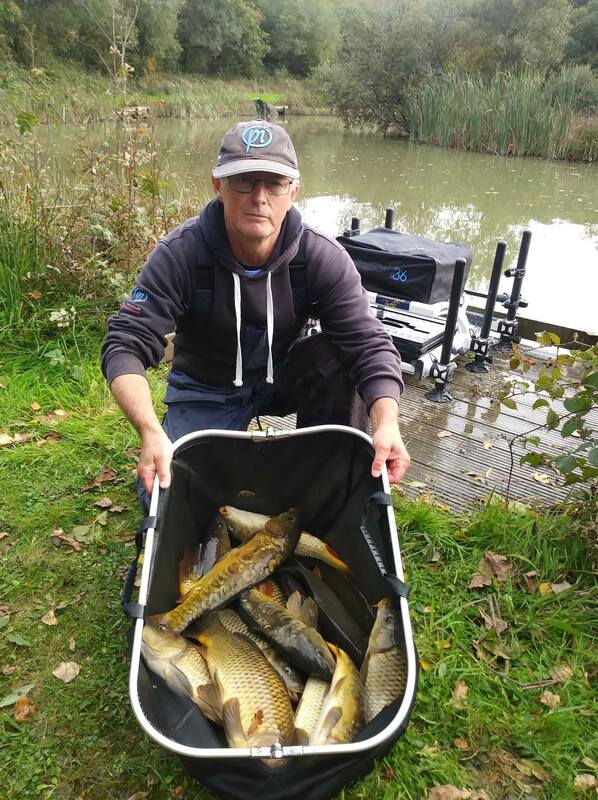 With the carp holed up tight, the silver fish at least gave sport for some, while others just enjoyed the day out, the occasional drizzle and banter…. the John “I’m admitting to 10lb, but your carp are bigger” Lisle and Pete “I only have 10lb” Slade banter continued after the match! 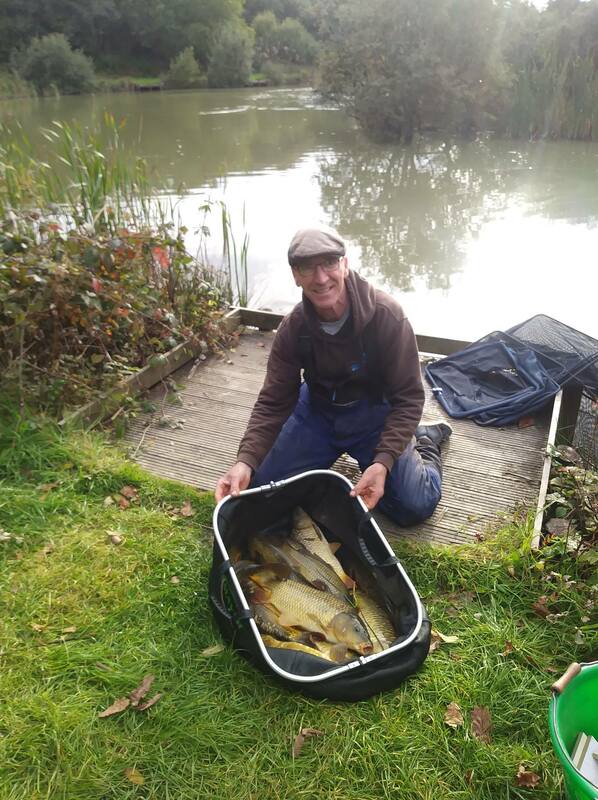 Overall winner on the day was Neilsen Jeffrey, pegged on the wood side of the Carp Match lake, weighing in 53lb 2oz of carp caught mainly on the pole. 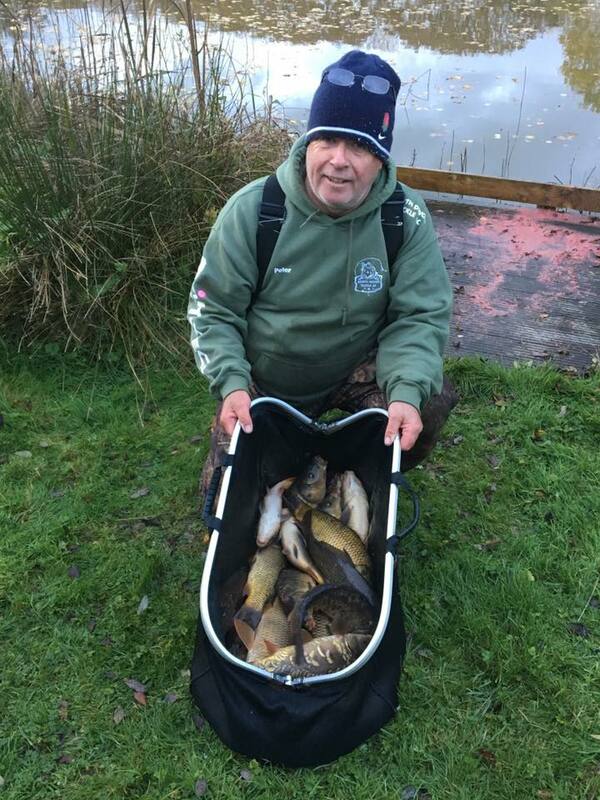 Second was Kevin Shears, from the point on the Mixed match lake, with 40lb 4oz. 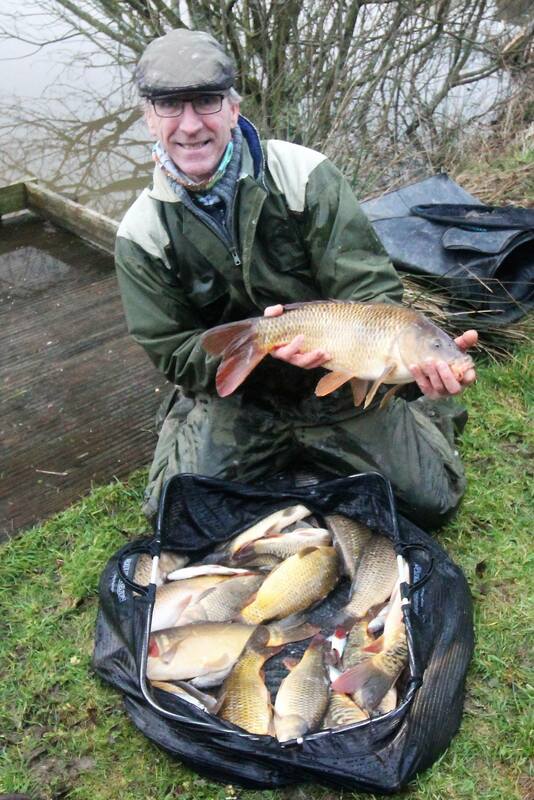 Third was Lewis Jones with 37lb 12oz at the far end of the Carp Match lake. 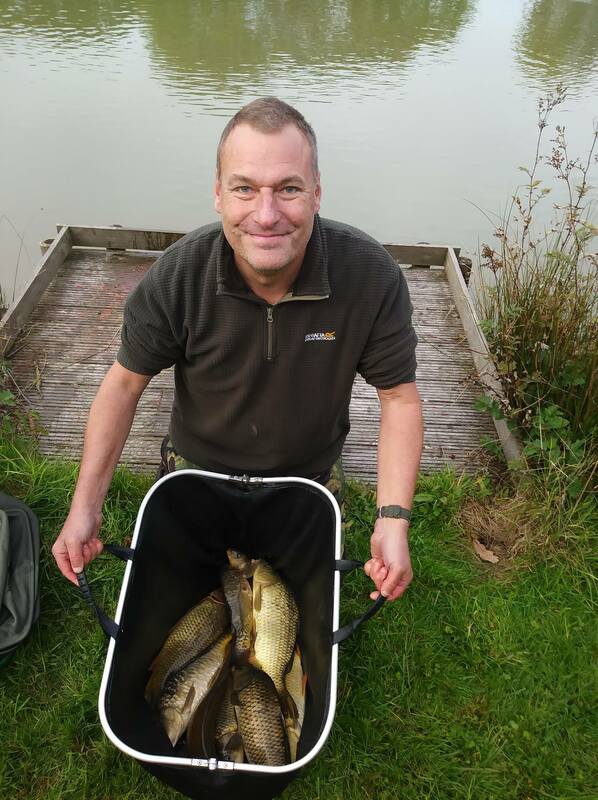 The blind pairs was a tight encounter with Kevin Shears and Rich Dennis on 75lb 3oz just beating Mat Sampson and Neilsen Jeffrey on 72lb 6oz. Kevin and Rich picking up a crate of beer each for their win. 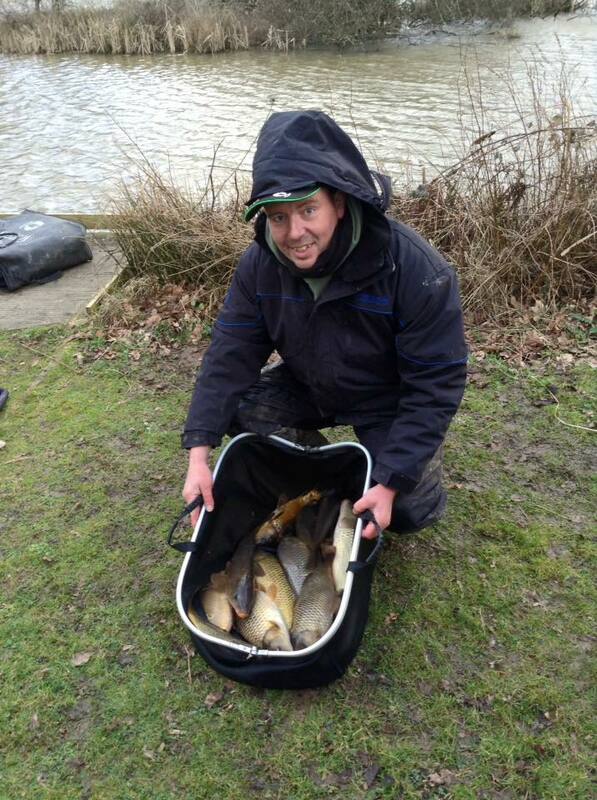 The mystery weight (of 12lb 1oz) was won by Ian Croxton with 12lb 2oz, who picked up a bottle of bubbly. 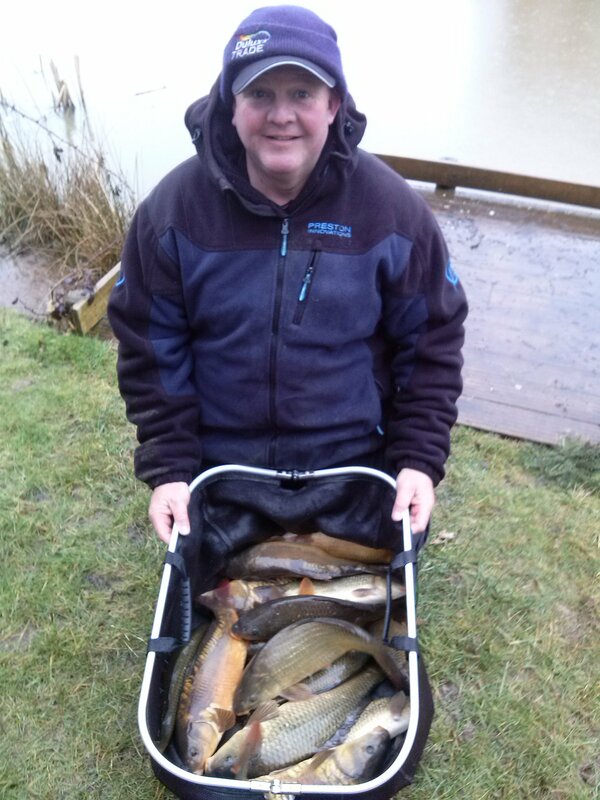 All anglers also picked up a selection of prizes from 1st place down to the wooden spoon. 6th Mark Richard 45lb 11oz . 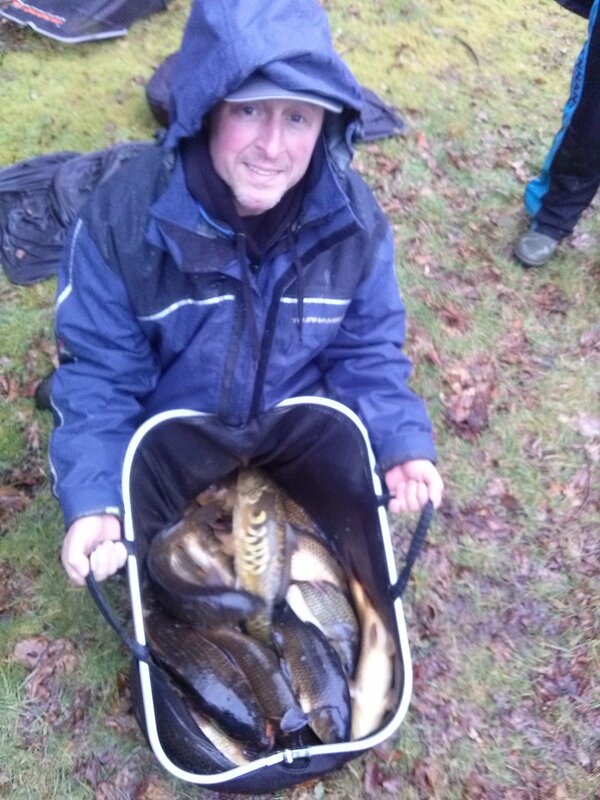 15 fished.We used the 2 lower match lakes on the prolific complex and enjoyed a dry still autumnal day. 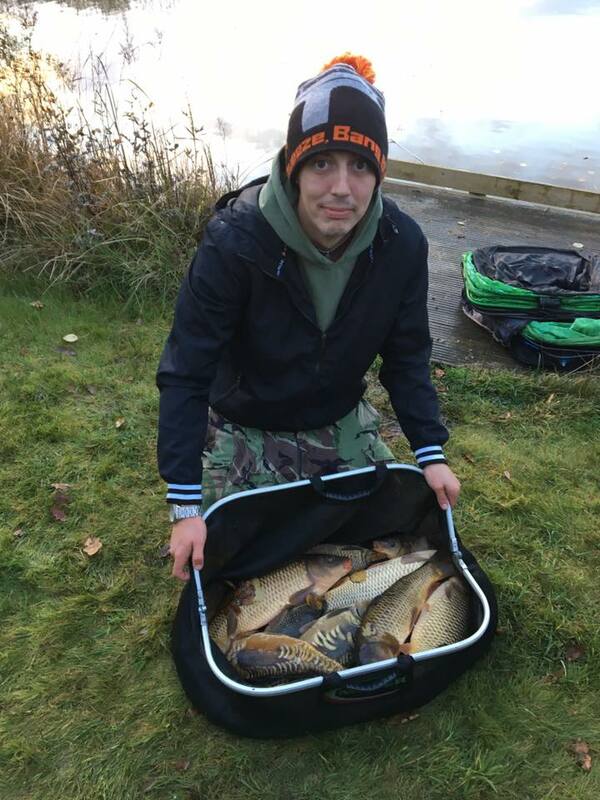 Neilsen Jeffery got his winter league campaign off to a great start with a net of pole caught carp from the roadside bank on the bottom lake , Paul Morris was next peg and landed his 2nd place catch on both method feeder and pole. 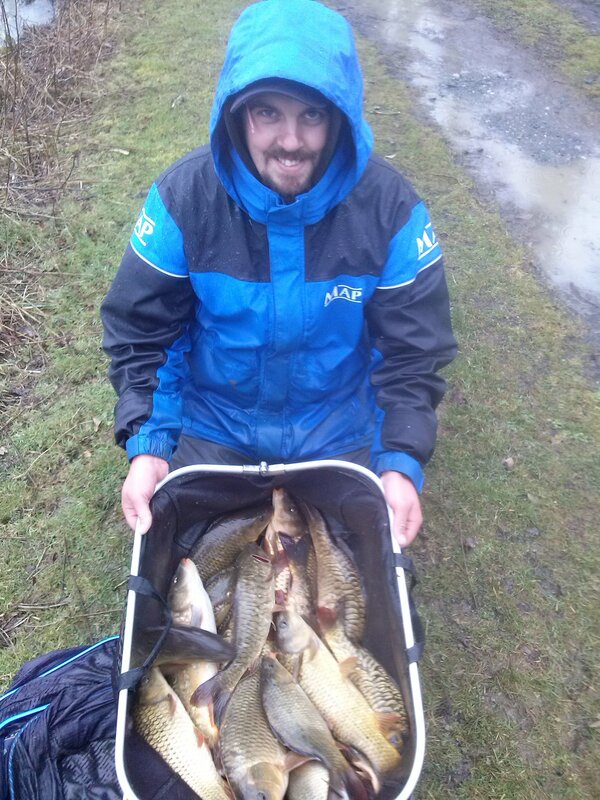 Shaun Stenton used similar tactics on the first lake for 3rd place Christopher Morris was 4th from the opposite bank. The pictures below sum up the Spring so far. 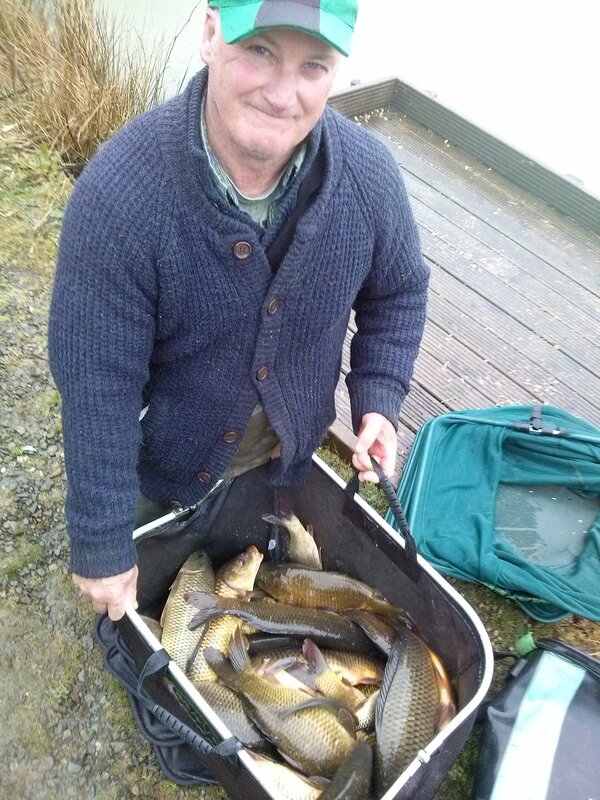 Many thanks to Martin Turner for his new report from the enduring North Devon Match Group! 6th Nathan Underwood 31lb 2oz . Silvers James Grogan 7lb 1oz . Despite our efforts that man Shears has secured yet another victory! 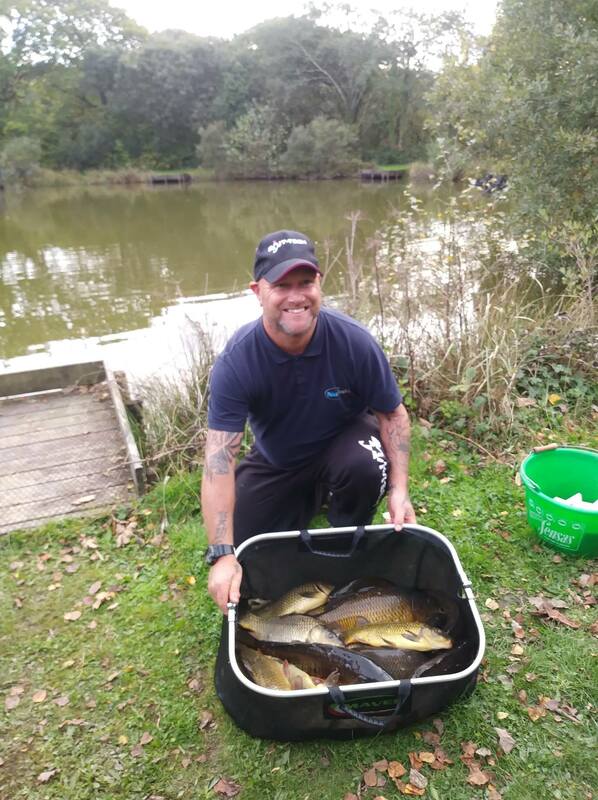 Kevin drew on the road side on lake 4 and landed 20 carp on corn on the pole in the margins. 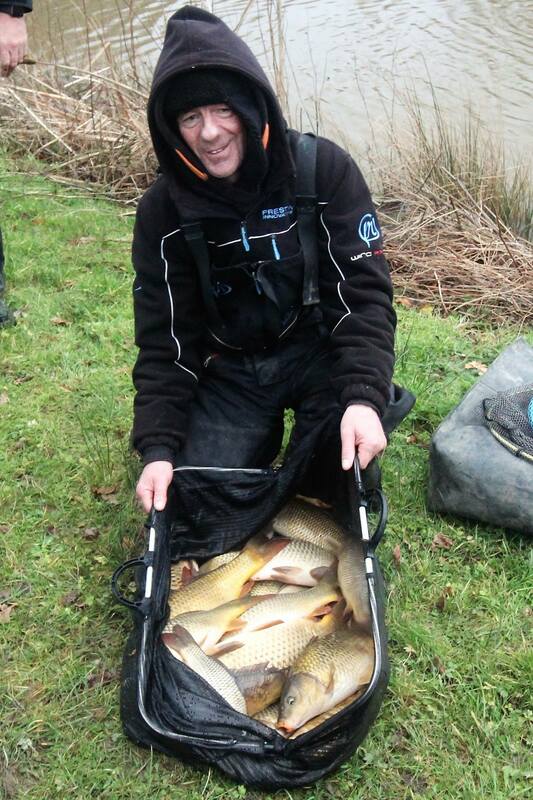 Christopher drew on one of the reed beds on lake 3 for second also on corn on the pole. 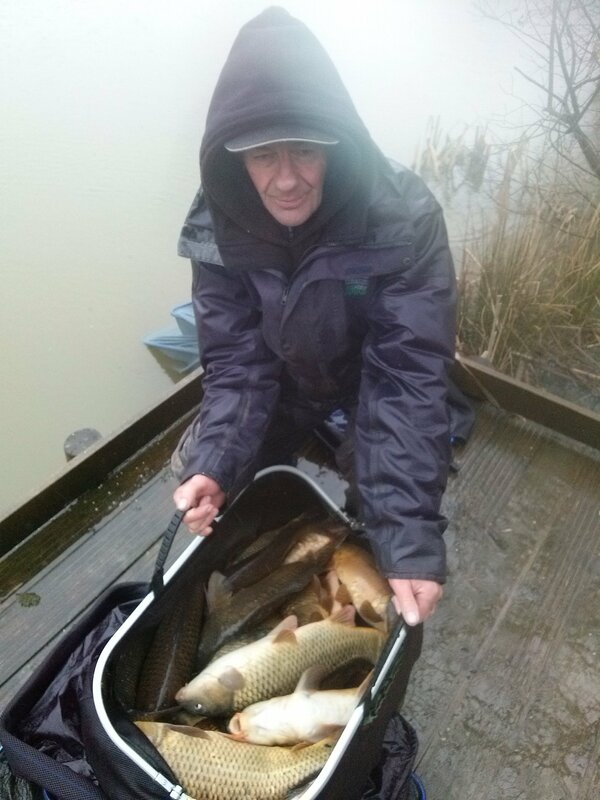 Martin was next peg to him , and caught on bread and maggots. 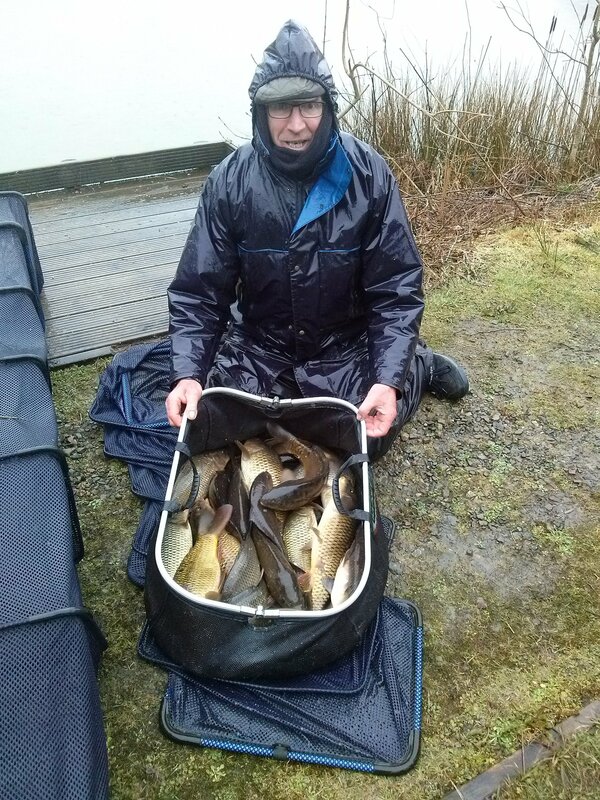 The spring day started well for the 17 competitors but deteriorated in to sleet by the time we weighed in .Thanks to Start Sharp for allowing us to use both lakes and providing breakfast rolls. Twenty anglers fished the 2017 Fur n Feather match held across lakes 3 and 4. 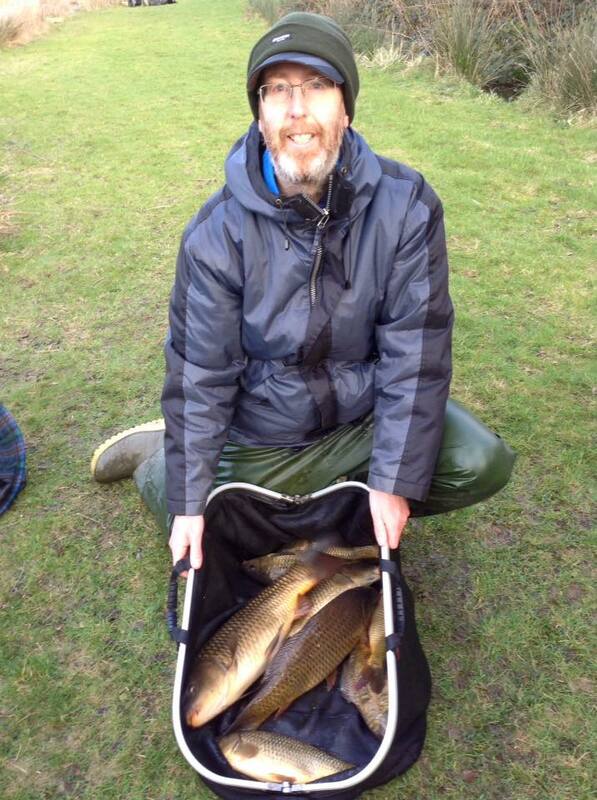 With cold water coming into the lakes and a gusty wind, it was not easy fishing. 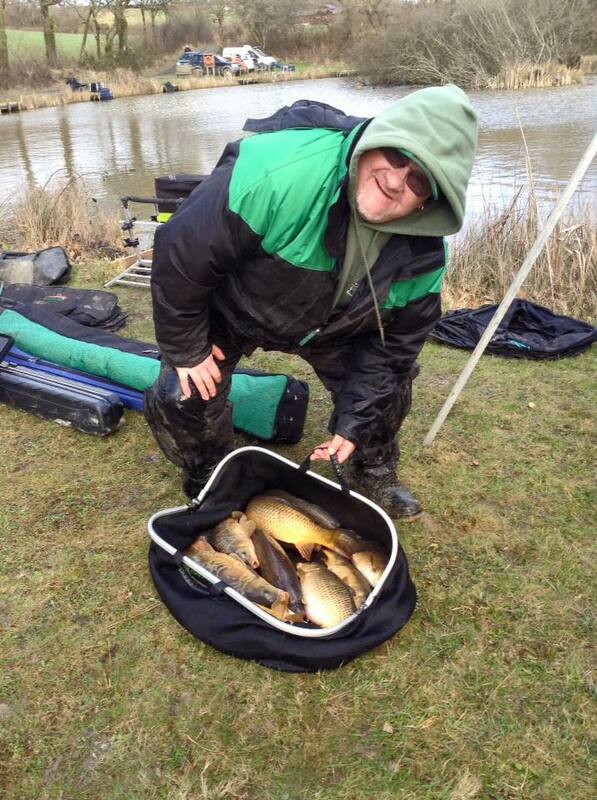 Kevin Shears (Above), pegged on the trackside on lake 4, took the win with 62lb 3oz of pole caught carp. 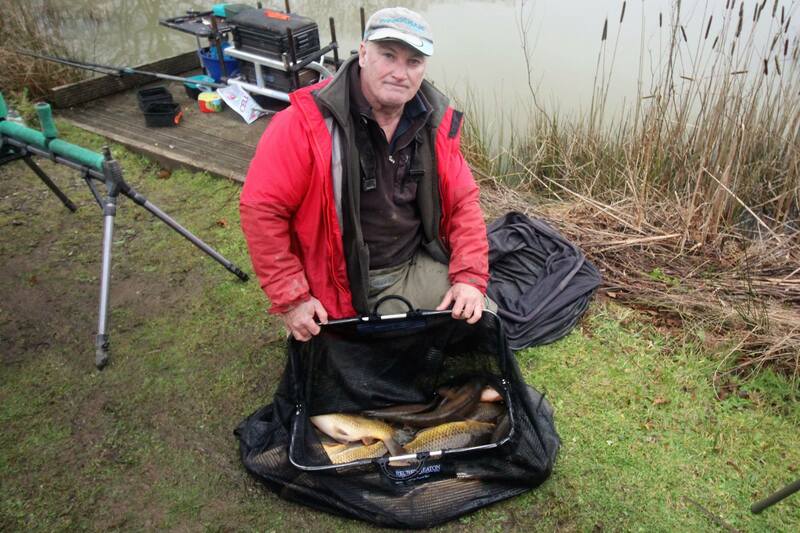 Second overall was Paul Ware, on the point peg on lake 3, with 47lb 3oz. 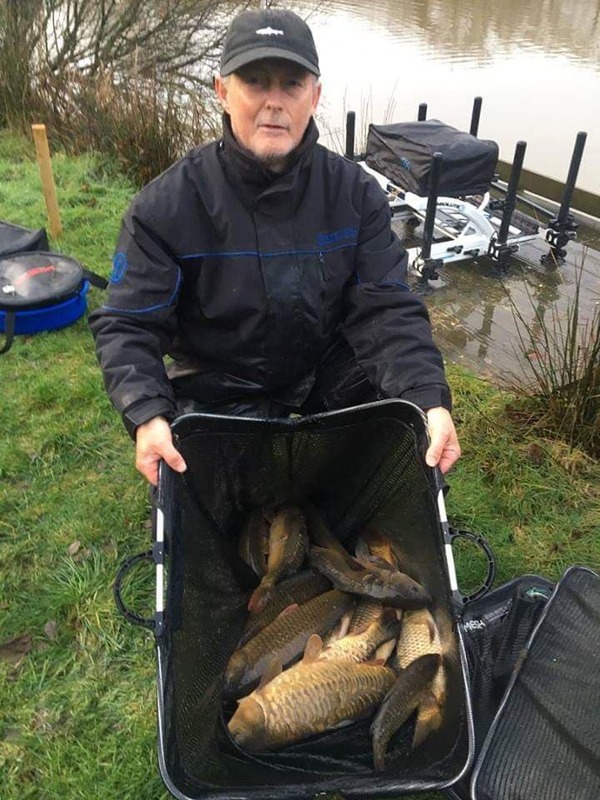 Martin Turner(Below) was third with 45lb 1oz from the wood side of lake 4. 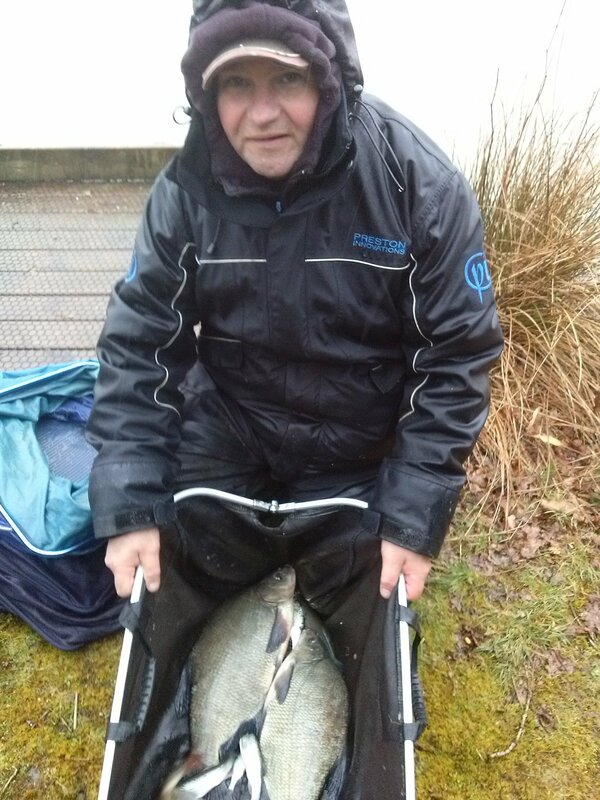 The random pairs was won by Shaun Stenton and Kevin Shears with a total of 101lb. 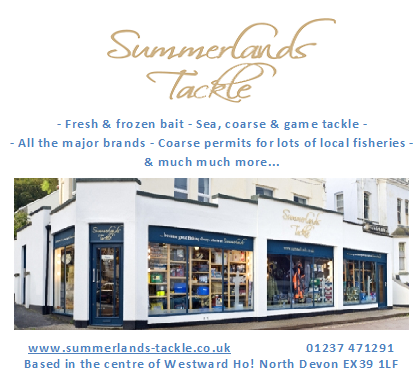 All anglers went away with a range of prizes. 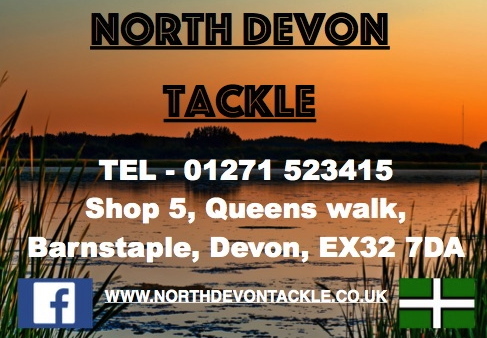 North Devon Tackle AC held their latest match at Wooda Lakes Complex (match carp lake) on Sunday November 6th. 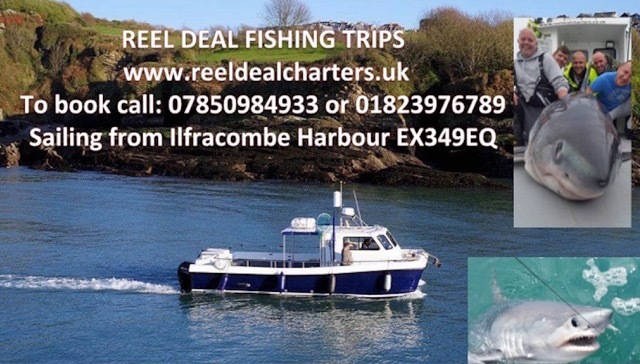 Fishing was tough with cold weather overnight. 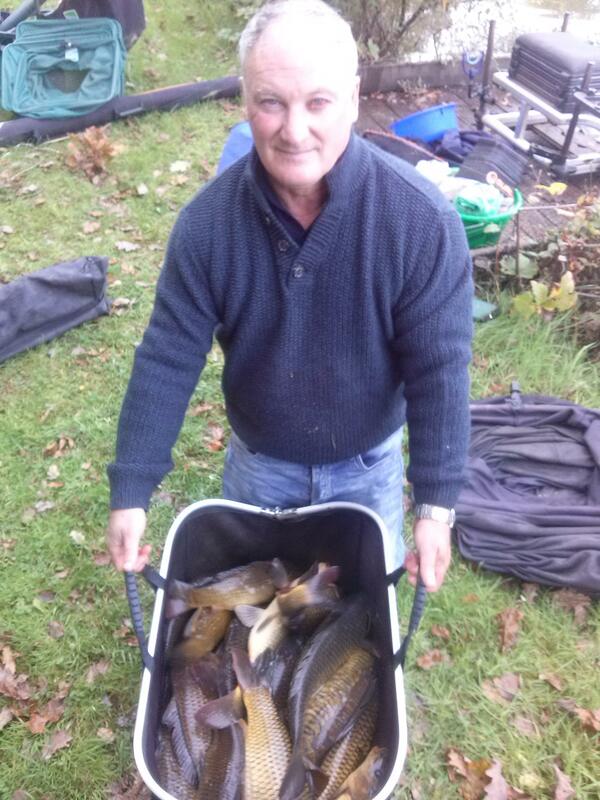 Top weight went to Kevin Wilton with 51lb 13oz of carp on pole and feeder. 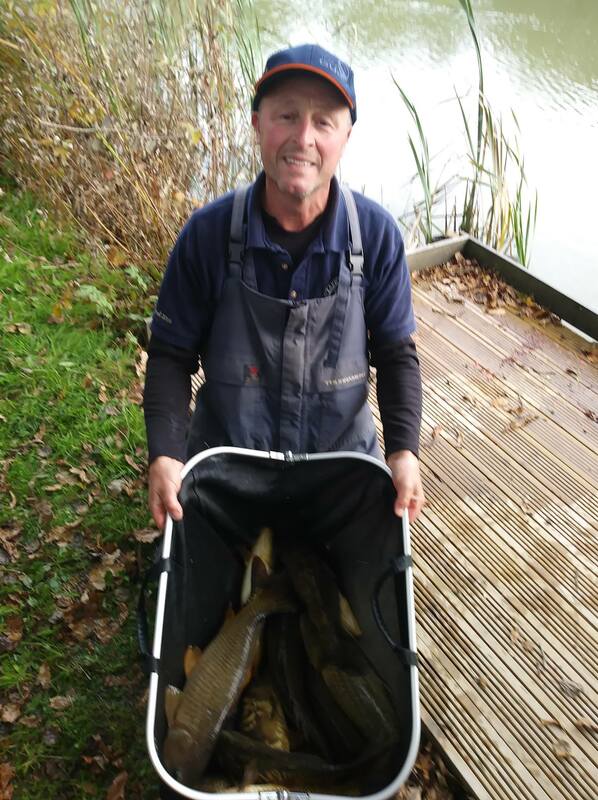 Second was Peter Seaward with 40lb 11oz and third was Dion Martin with 31lb 15oz.